Location is excellent, since it is very near to the city center area. Also, the place is surrounded by many good restaurants. The staff was very helpful and so friendly as well. Excellent location. Clean rooms, very comfortable. Great for families. We had a wonderful time here with kids. Polite and helpful staff. We needed a place for a quick overnight trip from London to Birmingham to see a show at the Hippodrome Theater. Stay City seemed close so we booked it. Great decision. The unit was just what we needed. Two bedrooms and two baths with a large living room with a bit of a kitchen too. The four of us were very comfortable and had the privacy needed. All for the cost of a hotel room. And the theater was only a few hundred yards from the door. The location is good and the 24 hours reception service which is not common for a self service apartment. Everything! The service was incredible, rooms were clean and huge balcony. 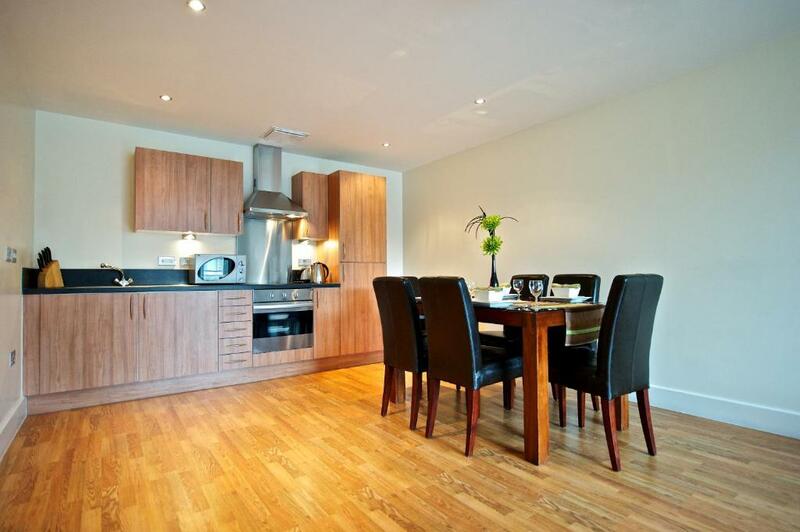 Location is very convenient in city centre near train station. Lots of room to spread out with separate living room/kitchen. Washer was a big plus. 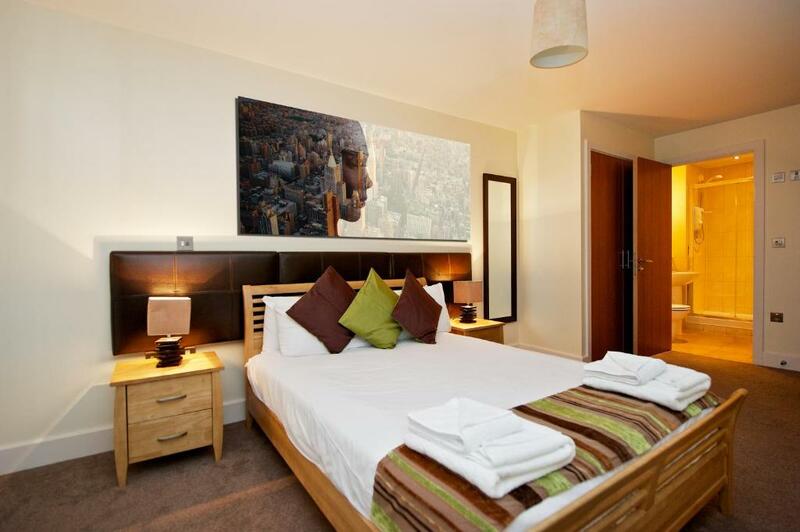 Lock in a great price for Staycity Aparthotels Arcadian Centre – rated 8.7 by recent guests! Staycity Aparthotels Arcadian Centre This rating is a reflection of how the property compares to the industry standard when it comes to price, facilities and services available. It's based on a self-evaluation by the property. Use this rating to help choose your stay! 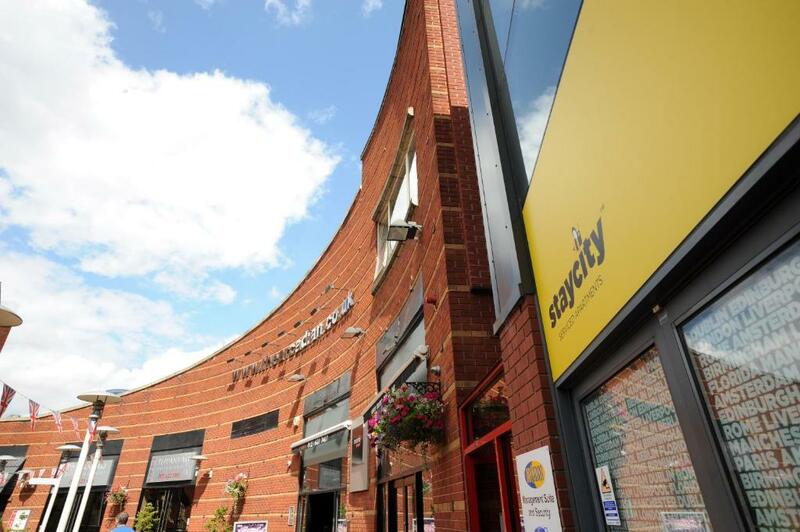 One of our top picks in Birmingham.Just a 2-minute walk from the Bullring Shopping Center, the contemporary and spacious Staycity Serviced Apartments Arcadian Centre provides free Wi-Fi. An LCD TV is available in each living area. All apartments have a leather sofa bed and feature a balcony with either city or courtyard views. A washer and dryer, refrigerator and microwave are included in each fully-furnished, modern kitchen. Bedrooms at the Staycity Serviced Apartments Arcadian Centre have stylish, simple decor with a full-length mirror and a modern private bathroom. The O2 Academy, a concert venue, is a 5-minute walk from the apartments. Birmingham New Street Train Station is a 10-minute walk away. 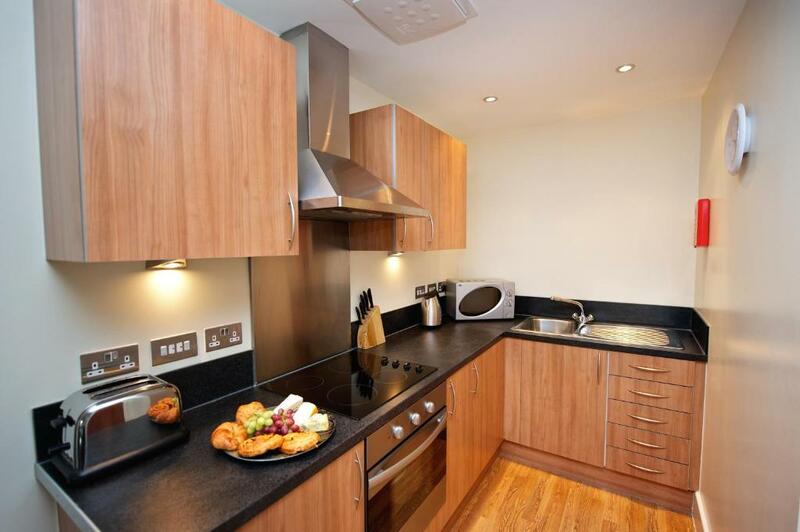 뀐 Located in the real heart of Birmingham, this property has an excellent location score of 9.2! 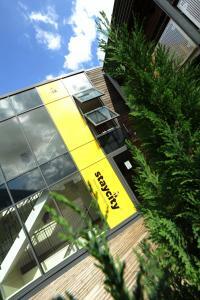 When would you like to stay at Staycity Aparthotels Arcadian Centre? This apartment includes one bedroom with a double bed (or 2 single beds), a sofa bed, full kitchen, free Wi-Fi, balcony, sitting room and dining area. 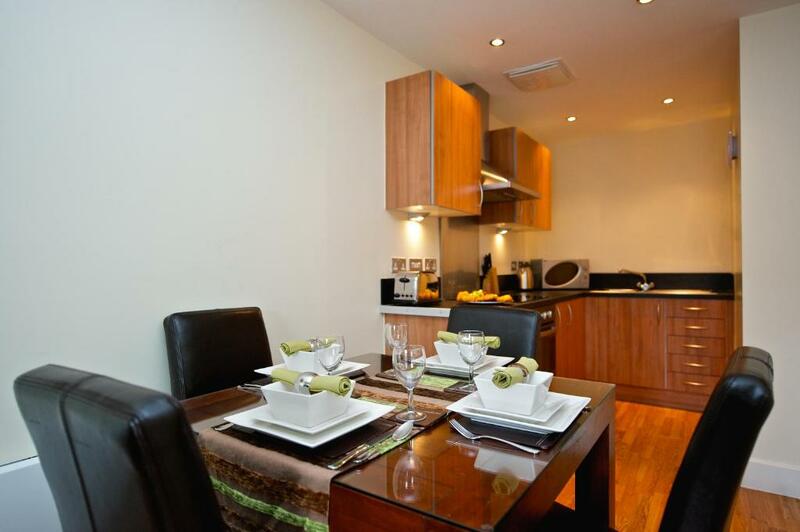 The apartments can accommodate a maximum of 3 people. Private parking is available on site (reservation is not needed) and costs GBP 13 per day. This apartment includes 2 bedrooms with one standard double bed in first bedroom, and either a double bed or 2 single beds in the second bedroom, a sofa bed, full kitchen, free Wi-Fi, balcony, sitting room and dining area. The apartments can accommodate a maximum of 5 people. This apartment includes 2 bedrooms with one standard double bed in first bedroom, and either a double bed or 2 single beds in the second bedroom, 2 bathrooms, a sofa bed, full kitchen, free Wi-Fi, balcony, sitting room and dining area. The apartments can accommodate a maximum of 5 people. Featuring a 32-inch LED TV with a Blu-ray player in the lounge and LCD TV in bedroom, this room includes an iPod docking station, a Nespresso coffee maker with 5 different refills daily and fresh milk upon arrival. Fresh towels provided daily with free late check-out until 12 pm. 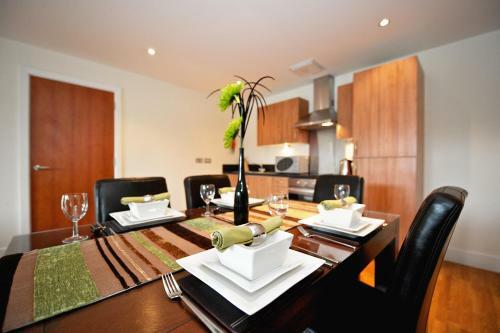 Spacious, comfortable 1 & 2 bedroom serviced apartments in the heart of The Arcadian centre in Birmingham offering all of the comforts of a home. House Rules Staycity Aparthotels Arcadian Centre takes special requests – add in the next step! Staycity Aparthotels Arcadian Centre accepts these cards and reserves the right to temporarily hold an amount prior to arrival. For bookings of 5 or more apartments, different policies and additional supplements will apply, and the customer will be contacted by Staycity Serviced Apartments with more information. Please note that the apartments cannot be used for parties. Please note that guests are required to present a valid photo ID upon check-in. The entrance to the Arcadian Euro Car Park is located at 41 Bromsgrove Street, Birmingham, B5 6NU and you are required to park on the 3rd level. A fee of GBP 13 per night per vehicle is applicable for 24 hours parking and is a multiple entry/exit car park. There is no need to pre-book parking for Staycity Arcadian Center. Please note there is a height restriction in the parking lot of 8.2 feet. Guests are kindly requested to inform the hotel of the required bedding configuration. This can be noted in the Special Request box during booking or by contacting the property using the contact details can be found on the booking confirmation. Please be aware that a GBP 50 deposit per person will be applied on arrival (children up to 15 years are exempt). This deposit will be charged in a single transaction, covering all guests. The property reserves the right to withhold some or all of the security deposit in case of any damage, guest misconduct, excessive electricity usage, and/or breaches to regulations. If the security deposit was paid in cash, it will be refunded upon departure once a Staycity representative has verified the apartment's condition. Security deposits pre-authorized on a credit card or charged to a debit card will be refunded as per the bank’s policy. A damage deposit of GBP 250 is required on arrival. That's about 325.24USD. You should be reimbursed on check-out. Unfortunately there was no windows or much air circulation in the corridor outside our apartment which meant bad smells lingered horribly- apparently people like to cook fish and old socks because that what it smelt like! Also, apparently it was a one off technical fault but some damn alarm rang repeatedly in short bursts throughout the building around 3am. Proper loud, we couldn’t work out of it was some kind of intermittent fire alarm so rang reception and was told it was due to a fault. This was dealt with after about 30mins but was VERY loud and annoying every few mins until then.. totally ruined our sleep- would’ve been pretty great otherwise. Always stay here on a night out. Can’t ever fault the rooms, service or price. It would be good to mention about the parking and how to get there on the parking section of the facilities. The sat nav can get confused at times. But I called reception after reaching and was given clear instructions. Thanks. Reception staff were very helpful and have a welcoming smile always. Apartment was very spacious and clean. too much noise outside all night. but i guess thats expected being in the city! Check in gentlemen was lovely and very helpful. Nothing, in my opinion everything is as expected and much more. The place wasn't well kept, not very inviting, wouldn't recommend staying there, had to pay for parking, they weren't very accommodating. Really enjoyed our stay. Only complaint is that the walls are paper thin and we could hear children running up and down the corridor all night. I would recommend asking for a room on the 6th floor. Great location, very clean and comfortable, also has parking. We had an apartment next to a race track it’s seems as from 2am to 4am was loud music, cars racing and lots of noise!